You are here: Home / Food Promotion / Experience A Night of Oriental Culinary Delights with Johnnie Walker Gold Label Reserve at The Golden Celebration! 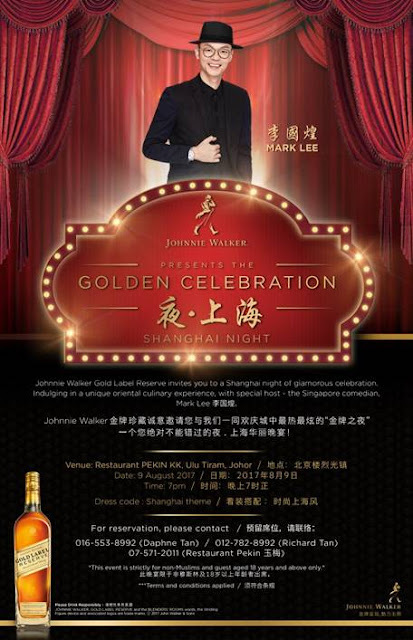 Experience A Night of Oriental Culinary Delights with Johnnie Walker Gold Label Reserve at The Golden Celebration! On this very evening themed ‘Shanghai Night’, a feast of 5 delectable dishes prepared by Chef 周其來, exclusively prepared for Johnnie Walker Gold Label Reserve awaits the guests, offering them with a memorable dining experience. Guests will have the opportunity to taste the burst of delectable flavours from the array of oriental dishes served paired together with the luxurious taste of Johnnie Walker Gold Label Reserve, the perfect blend for celebratory occasions. Some of the signature dishes that will be served include the Boston Lobster Claw with Cheesetart, Boston Lobster Head Braised Noodles with Grilled Iberico and the Johnnie Walker Gold Label Reserve Braised Boston Lobster Body, just to name a few! In addition, well-loved Singaporean comedian, television host and film director, Mark Lee will be present to host the night of glamorous celebrations, making it a night to remember! Label Reserve priced at RM230/ bottle to be entitled to a seat.